We have faucet. Repeat, we have faucet. This is not a drill! 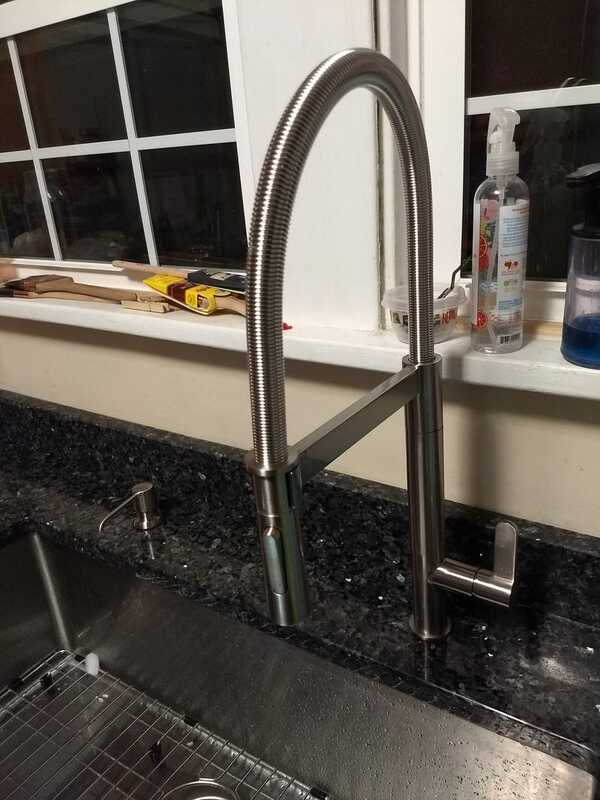 After waiting the requisite 24 hours before hooking up the plumbing and getting our fawnsay new granite wet, it was time to hook up our also fawnsay new faucet. My wife and I are both sick of the moderately expensive garbage from home centers, so we decided to spend a chunk of change and get a good one. We went to a Ferguson plumbing showroom to check out some options. When I redid our master bathroom six years ago, we used them for all our fixtures and were very happy with their service, and the stuff we bought from them. Much to my surprise and delight, my wife picked out the cheapest version of the style of faucet we wanted. We spent approximately three RallyMetros on a Mirabelle faucet. It would’ve only been 2-1/2 RallyMetros, but the boss wanted brushed stainless instead of chrome. I’d never heard of Mirabelle. The salesman told us it’s Ferguson’s private label manufacturer. I didn’t check if he was telling the truth about that, because I don’t care. The faucet is really nice. The valve handle is metal, and has a nice action on it. The sprayer nozzle button also has a really nice action. The water pressure is really good too, so much so I won’t be messing with the restrictor. I didn’t take any installation pictures, because frankly I just wanted to slam it in and be done with it. There were a couple things that impressed me. The first was the nut that attaches it to the bottom of the counter. It has a brass thread insert, but that’s pressed into a big chunky plastic nut, that you can wrap your whole fist around and apply plenty of torque with no wrench. The second thing that impressed me, was the supply lines were built right in. No need for secondary supply hoses, just attach the faucet directly to the shut off valves under the sink. Overall, I’m quite pleased with this purchase. Yes, the faucet is off center. We did that on purpose.